Why Is “The Hate U Give” a Must-Read for the “Potter” Fandom? Let’s take a few minutes to talk about the most important YA book release of 2017. 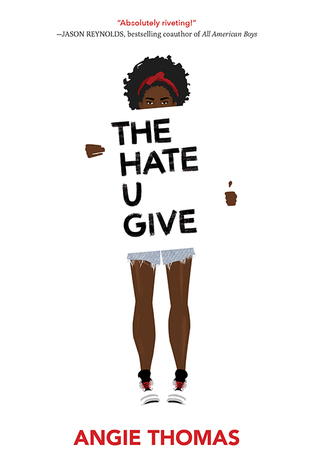 The Hate U Give by Angie Thomas offers readers a look inside the Black Lives Matter movement through the eyes of a 16-year-old black girl who goes from reblogging pictures of police brutality victims on her Tumblr in solidarity to witnessing her friend being killed by a cop firsthand. This book is real. It calls people out. It offers a lot of really hard truths for everyone out there. Starr always told herself she would be loud if something happened to one of her friends, but that isn’t so easy now that she’s in that very situation. If she publicly speaks out, her friends at Williamson High could abandon her, and even worse, her life could be in danger at home. Her black friends don’t understand her silence, and her white friends won’t understand her stand against police violence. When it comes down to it, Starr is one of us. The book is rife with Potter references, reminding us that Starr is a normal teen. She identifies as a Slytherin and wishes she could go to the Wizarding World. She and her childhood friends called themselves “the Hood Trio.” But Starr isn’t a Chosen One. She’s just a normal girl who finds herself next to her friend as the light leaves his eyes, his blood coating her hands. She’s one of us, and she has a reason to fight. Why is this book important? It makes the Black Lives Matter movement accessible to people who just might not understand it. The how and the why are what makes this book so deserving of every accolade it receives. The Hate U Give reminds readers that black lives do matter and that they matter too. This book shows racism down to its simplest form – from a person who doesn’t realize they’re racist and won’t apologize for it. This book sheds light on the riots that follow the injustices taking place in police brutality cases. This book takes both sides in a healthy stance, proving that there are good members of law enforcement despite the bad and that even the most righteous indignation can be expressed the wrong way. This book asks why a child – a 16-year-old boy – could “deserve to die,” even if he was a thug. I urge you now, if you haven’t yet, to pick up a copy of Angie Thomas’s stunning debut, which has been heralded by John Green as a “modern classic.” This is a fictional account of the real-world equivalent of Voldemort targeting Muggle-borns, and it’s happening right now. As Potter fans, we have been taught empathy. We’ve seen what can happen to a minority when no one is willing to stand up for them, and we wanted to help. If you stood with Hermione, you should stand now with Starr as she faces what the black youth in America is currently up against, and you should fight with them. The first step is understanding, and this book offers readers a way in. Take it. Have you read The Hate U Give? Let us know your thoughts on this important new work. Get Ready for the National Tour of “The Lightning Thief: The Percy Jackson Musical”!